“Pooka” is the name of a certain mischievous spirit found in Irish folklore – which often appears in the form of an animal or goblin. 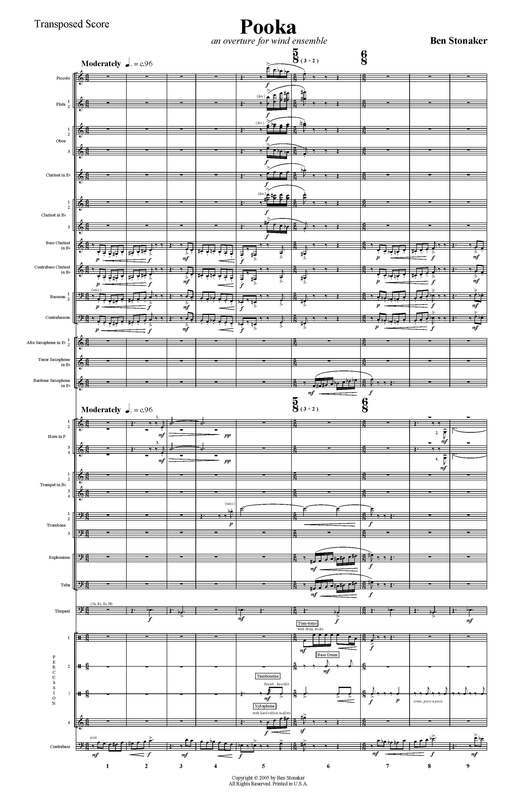 This overture was originally inspired by the idea of one particular “pooka” – a giant rabbit from the movie “Harvey” (1950, directed by Henry Koster, based on the play by Mary Chase, and starring Jimmy Stewart). Most of the piece is relatively loud and heavy, full of energy and momentum. The piece closes, however, in an almost dreamlike state – marked “listlessly” –combining a sudden lack of energy with a sense of lethargic sluggishness. Pooka was originally completed in the summer of 2003 in Baton Rouge, Louisiana. The score was completed, along with revisions to the percussion and brass parts, in 2005 in Kansas City, Missouri. Pooka received honorable mention in the 2006 ASCAP/CBDNA Frederick Fennell Prize for The Best Original Score for Concert Band.